We manufacture storage tanks and process equipment to the brewing, beverage, food, and waste, pharmaceutical and chemical industries. 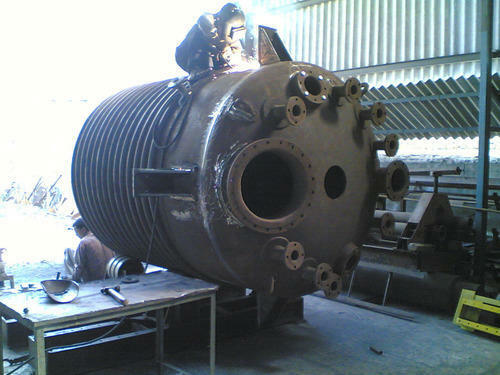 We also supply mild steel tanks. We handle the increasing demand for high quality stainless steel storage and process vessels from a wide range of industries each with its own requirements. manufactures storage vessels from 50 litres to 25,000 litres which can be used for various applications. Stainless steel Tank,Mixing tank,Pharmaceutical Tank,Food processing tank,Chemical mixing tank, Jacketed tank,Agitator tank,Fermentation tank,Variable capacity winery tanks,Sanitary Storage tank,Pressure vessel,Reactor kettle,CIP system,Milk cooling tank,etc. Formed in 1996, we, “Akshar Engineering Works” are involved in manufacturing, supplying, exporting quality range of Pharmaceuticals Machinery In Filtration Equipments. Our assortment of products includes Sparkler Filter Press, Zero Hold Up Filter Press, Oil Filtration Machine and Filter Press Filtration Machine. We have strong belief of serving clients with maximum contentment while maintaining superior quality in our products. In direction of this aim, we make effective utilization of material and technology which makes our products highly productive, sturdy and imparting long life functionality with low maintenance. Moreover, we intend to supply our products in durable packaging at equitable price tags. We are able to fulfill the bulk demands of customers through our cutting-edge infrastructure system which encompasses all traits of quality management system. Our infrastructure system contains high-end manufacturing facility, in-house quality testing and spacious warehousing facility. Our production unit is well furnished with computerized machinery and long production lines for carrying out fabrication with extreme precision engineering. In addition to this, we provide utmost assurance quality of our machines through reliable testing unit. With these aspects, we have earned ourselves huge clientele base across the world.